“These are very serious allegations and not to be taken lightly which is why I’ve taken the day to consider how to respond,” said Hardwick in a statement Friday night, adding that he was "blindsided" by ex-girlfriend Chloe Dykstra's Medium essay alleging emotional and sexually abusive behavior. “I was heartbroken to read Chloe’s post. Our three year relationship was not perfect—we were ultimately not a good match and argued—even shouted at each other—but I loved her, and did my best to uplift and support her as a partner and companion in any way and at no time did I sexually assault her.” Hardwick added: "When we were living together, I found out that Chloe had cheated on me, and I ended the relationship. For several weeks after we broke up, she asked to get back together with me and even told me she wanted to have kids with me, ‘build a life’ with me and told me that I was ‘the one,’ but I did not want to be with someone who was unfaithful. I’m devastated to read that she is now accusing me of conduct that did not occur. l was blindsided by her post and always wanted the best for her. 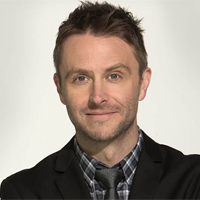 As a husband, a son, and future father, I do not condone any kind of mistreatment of women.” UPDATE: Hardwick's Talking with Chris Hardwick show has been pulled, as well as his San Diego Comic-Con appearances: “We have had a positive working relationship with Chris Hardwick for many years," AMC said in a statement. "We take the troubling allegations that surfaced yesterday very seriously. While we assess the situation, Talking with Chris Hardwick will not air on AMC, and Chris has decided to step aside from moderating planned AMC and BBC America panels at Comic-Con International in San Diego next month.” Hardwick was scheduled to moderate Jodie Whittaker's Doctor Who panel. Patty Hearst defends son-in-law Hardwick, calls Dykstra a "Bunny Boiler"